In many countries around the world, human rights are severely lacking. While we Kiwis can do better in some areas, we should be proud of the freedoms and protections we have as a liberal democracy. The types of systematic discrimination that exist in some parts of the world, where being gay is punished by death or where women are legally allowed to be beaten, for example, are considered abhorrent by society and are proscribed by our laws. Similarly, we cannot discriminate based on where someone was born (even if it was right here in Aotearoa), the colour of their skin, their religious beliefs, or any other of 12 categories. No nation has a perfect human rights record but some are further from ideal than others. Our shortcomings are put into sharp perspective when we consider some countries still have a thriving slave market, others don’t allow dissent and there are still countries that have discriminatory laws based on gender, religion, or sexual orientation. This sort of perspective is lost on many modern activist groups and even some of our political parties. The Green Party, for example, told us we “cannot support Australia on UN Human Rights Council” yet said nothing of the elections of Saudi Arabia, Venezuela, Burundi, or others to the esteemed Council. The inability to distinguish between degrees of inequality or injustice is brought sharply into focus when it comes to Israel. Just like the United Nations, there are a plethora of activist NGOs that have lost perspective and any semblance of balance through unfairly criticising and attacking the only Jewish state. Often the allegations and criticism is couched in the language of “human rights” doublespeak. However, one group is being exposed. Democratic governments are publicly acknowledging that the BDS movement, in particular, is incongruent with our liberal notion of human rights. Proponents of BDS seek to boycott, divest from, and sanction Israel. They often compare it to the boycotts against South Africa that helped bring about an end to Apartheid. There would be far less controversy if Israel was an Apartheid State; but it’s not. Nevertheless, BDS-ers state their demands threefold: an end to the occupation, “right of return” for Palestinians, and equality for Arabs in Israel. These causes make for good placards but actually undermine peace. Much has been written on the “occupation”, the “right of return”, and how Arabs are, in fact, currently equal citizens in Israel – Arabs are represented in parliament, and participate in all aspects of Israeli life. This is not to dismiss the socio-economic gap between the 20% Arab population and the Jewish population of Israel (just like there are socio-economic gaps between Māori/Pacific Islanders and European Kiwis). It would seem preposterous to suggest a boycott of New Zealand because we have inequality in society. Similarly, it is nonsensical to suggest the same for Israel, especially when policies are in place to address the issue, including a recent ₪15b (NZD$5.8b) investment to narrow the gap. A much stronger case of institutional injustice could be brought against those countries that actively discriminate against Palestinians and refuse them citizenship. BDS-ers are not interested in these countries. Neither are the “social justice warriors” too concerned with the Turkish occupation of Cyprus, the Chinese occupation of Tibet, or India’s occupation of Kashmir, for example, or those countries that lack even basic human rights. Most turn blind eyes to crimes committed by countries other than Israel and call foul when this is pointed out, saying “we must start somewhere” and “that doesn’t absolve Israel”. We do, indeed, need start somewhere and Israel, like any other country, does have work to do. However, boycotting a country, divesting funds from companies, and sanctioning a nation are extreme measures that should surely be reserved for the most extreme transgressions. Without any gradation of human rights we might as well equate the records of North Korea with North America. We have measures for freedom and democracy and Israel ranks higher than most so why should it be first and only on the list of targets? Furthermore, the conflict between Israel and the Palestinians cannot be simply reduced to “oppressed, good Palestinians” and “oppressive, bad Israelis”. That leads to dehumanising both Palestinians and Israelis. Yet a blind eye is also turned by BDS-ers to the responsibility of the Palestinian leadership in any peace process. It is as if their seeing-eye is sharply focussed on Israel. Once more, the Jews are blamed for everything. The singular focus on the only Jewish state and the disproportionate and extreme measures taken against Israel, an oasis of freedom in the Middle East, can only be explained by some form of anti-Semitism. Perhaps some of those advocating for BDS are not bigots but have simply been duped by the more extreme BDS-ers’ use of the human rights or social justice parlance. Indeed, the senior proponents of BDS are committed to denying the Jewish people self-determination while arguing vociferously for Palestinian self-determination. Regardless of how they try to dress it up, that is anti-Semitism. National Socialist Movement flyer from 1962. 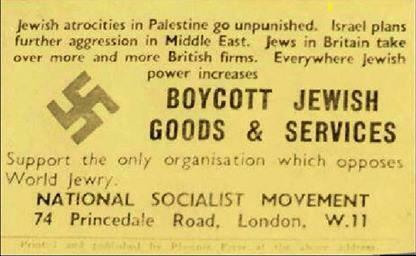 Sadly, though, boycotting Jews is not new. One week after taking power, Hitler ordered a boycott of any business owned by a Jew; laws were soon implemented that discriminated against Jews. The Arab League similarly established a formal boycott of Israeli goods and services upon the establishment of Israel in 1948, and it is still in force today though it is largely symbolic. The modern BDS campaign is also largely symbolic. 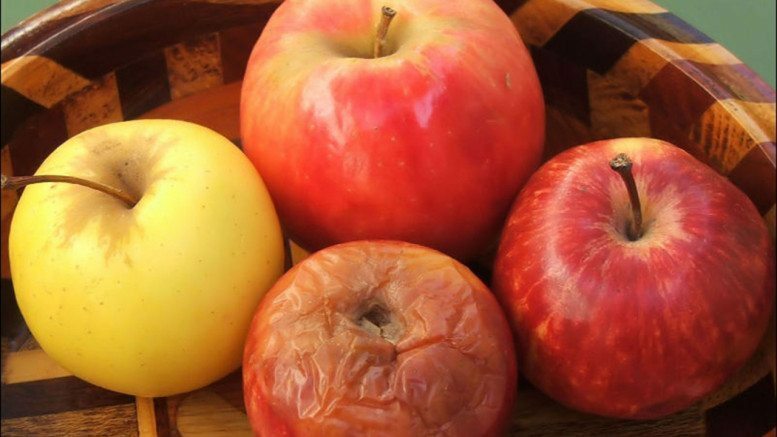 However, symbolism is important; symbolically singling out Israel for disproportionate measures that are born from a desire to see an end to Jewish self-determination does little to foster peace in the region. Symbolism in action can also hurt those it claims to help; when Israeli businesses are providing decent employment for Palestinians, boycotting them does little for the Palestinian people. The discriminatory and harmful nature of BDS has not escaped the judiciary or parliaments of other democratic countries. Canadian ministers passed a motion condemning BDS by a margin of 229-51; conservatives and liberals alike expressing support for such a denouncement. Foreign Affairs Minister Stéphane Dion said “The world will win nothing for boycotting Israel … the BDS movement is harmful and ineffective”. The motion says the BDS movement “promotes the demonization and delegitimization of the State of Israel” – two defined aspects of the new anti-Semitism. The United Kingdom has decided to prevent public institutions from boycotting Israel on threat of “severe penalties”. Senior government sources said they were cracking down on town-hall boycotts because they “undermined good community relations, poisoned and polarised debate and fuelled anti-Semitism”. Jeremy Corbyn’s Labour Party has opposed the decision despite BDS undermining Labour’s long-established foreign policy positions. Here in New Zealand there are a handful of extremists who protest outside the Warehouse because it stocks SodaStream, gather for more general anti-Israel protests, and attempt to raise misleading billboards. Activists have also physically targeted the NZ SuperFund offices and duped at least one of our leaders into signing pledges. Those MPs who signed the pledge knowing what it stood for were predominantly from the Green Party and Internet-Mana. Internet-Mana ran a campaign in which their only foreign policy platform was to support BDS. However, the Green Party has a more sophisticated “Global Affairs Policy” that purports to centre around human rights, peace, justice, and tolerance. However, it seems they largely tolerate countries with the worst records and only seek “justice” against Jews. If only there was more perspective and less anti-Semitism (at least in effect, if not intent) from some of our leaders. If only our other elected representatives or Human Rights champions could identify BDS for the damaging and discriminating faction it is and speak out like their counterparts in other progressive countries. Hopefully there will be those strong enough to condemn the hateful and racist BDS movement while it is still relatively small and not let it fester in New Zealand to spoil our human rights record.